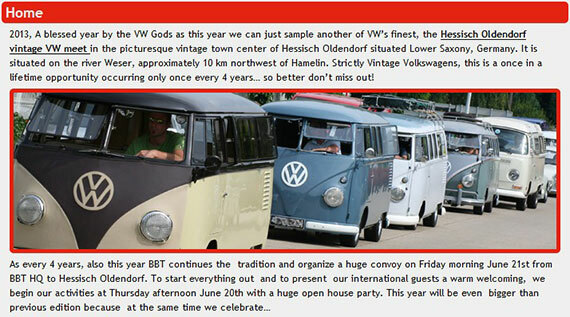 Nevertheless a part of BBT is making “BBT travels” reports from the other side of planet earth, preparation to the BBT Convoy to Hessisch Oldendorf 2013 continues. The BBT Convoy badge design is ready and a proof print will be available very soon. Flyers are being print, shirts and merchandising are on its way. The BBT collection cars which will participate to the convoy are getting a final check-up, catering… There’s way to much to list. This means we have to think about closing the registration so we will be able to see how many enthusiast will be with us to celebrate 25 years BBT and participate to the BBT Convoy. The date for registration closing is the 4th of June @ Midnight. So, if you want to participate to the BBT Convoy and aren’t yet registered… Don’t hesitate any longer and register before it’s to late! Click here to visit the register page.